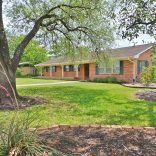 The Sterling House is a comfortable getaway! 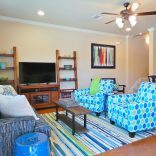 As you enter the living room you will notice the tasteful furnishings and tiled flooring. Watch your favorite sports channel or movie on the flat screen TV. Check out the beautiful stained concrete floors accent the galley style kitchen and open dining room. 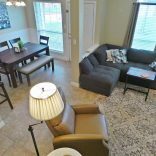 The Kitchen is stocked with everything you need to host family and friends for a game weekend and has an eat in dining area. There is an easily accessible full-size utility room, too. Step out to the small side patio through the dining room and you will find the charcoal grill for all your grilling needs. Feel right at home in each of the four private and cozy bedrooms. The hall bath provides a clean, elongated vanity with double sinks and separate shower area. The Elegant master suite with private bath opens onto another covered patio area overlooking the backyard. Plenty of parking spaces in front for all guests to use. Centrally located in the heart of College Station, exceedingly convenient to Kyle Field, Ozona Bar and Grill, Johnny Carino’s Italian Café, Post Oak Mall and of course Texas A&M University. Also, visit the nearby Wolf Pen Creek Park for a beautiful walk along the wooded trails or an outdoor summer concert or game of Frisbee Golf!